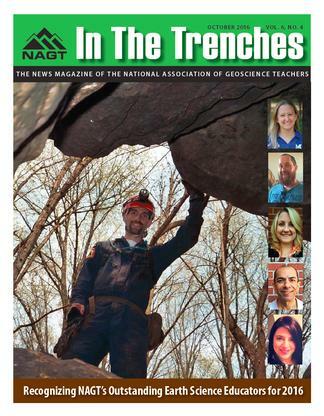 Each fall at the annual meeting of the Geological Society of America we celebrate outstanding Earth science teachers. Pictured here are a few of them: (left) Troy Simpson; (right, top to bottom) Lindsay Knippenberg, Matt Affolter, Kathryn Busby, Mohamed Kabani, and Belinda Jacobs. Students at Eastern Michigan University explore the AR Sandbox with their lab instructor, Wendy Dorman. JGE Outstanding Paper Award - Caitlin N. Callahan, Julie C. Libarkin, Carmen M. McCallum, and Christopher L. Atchison "Using the Lens of Social Capital to Understand Diversity in the Earth System Sciences Workforce"
OUTSTANDING EARTH SCIENCE TEACHER (OEST) AWARDS are given for "exceptional contributions to the stimulation of interest in the Earth sciences at the pre-college level." Any teacher or K-12 educator who covers a significant amount of Earth science content with his or her students is eligible. Ten national finalists are selected, one from each NAGT regional section. Some sections also recognize state winners. The OEST Awards program is designed to identify excellence in teaching, recognize and reward excellence in teaching, stimulate higher levels of teaching performance, establish NAGT as a strong support organization for pre-college education, and, via active statewide and sectional programs, build a solid state, regional, and national liaison with administrators of pre-college Earth science education. Read all about the 2016 winners on the website: http://nagt.org/nagt/awards/oest/2016.html. 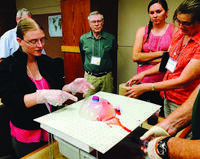 "I didn't realize how broad the geoscience education community was," commented one of the 330 professionals gathered at the second annual Earth Educators' Rendezvous, held July 18-22 at the University of Wisconsin in Madison. Attendees included researchers and practitioners working on all aspects of undergraduate Earth education, including K-12 teacher preparation and professional development, two-year college programs, and graduate student preparation, as well as informal education and community outreach. Many attendees took on multiple roles at the meeting, which was an engaging mix of workshops, oral and poster sessions, panel discussions, teaching demonstrations, and plenary presentations by nationally recognized speakers. Read full article. The Spatial Thinking Workbook project is focused on improving spatial skills in upper-division undergraduate geoscience courses. Specifically, the goal is to improve students' penetrative thinking skills (ability to imagine what the interior of an object looks like), using an intellectual framework from cognitive science and innovative teaching in the geological sciences. The Synthesis of Research on Thinking and Learning in the Geosciences project aimed to synthesize existing knowledge and articulate unanswered questions in critical areas of research on cognition and learning relevant to the Geosciences. One of the facets they explored was Spatial Thinking. Each of the areas they studied plays a central role in how human beings think about the Earth and learn to think about the Earth, and each poses substantial cognitive challenges. In addition, they sought to understand how geoscientists integrate these different types of learning in drawing inferences about the Earth. The mission of the Earth & Mind blog is to facilitate discussion and discovery about how humans think and learn about the Earth and environment. Earth & Mind explores the intersection between Geosciences, Education and Cognitive Sciences. One of the prominent areas of interest for the blog is the interface of spatial thinking and the geosciences.